Taking a break at Art & Soul - Virginia. Morning Loyal Blog Readers. I have been writing and rewriting this blog page totally in my head for weeks - editing in my head, laughing uproariously at my clever turn of word; framing photos for the most wow response, but now it all comes down to sitting here, cold feet and all, poking at these dern computer keys to make the words and thoughts sit on this computer screen - and stay there! I simply cannot wait for the computer thingy that plugs into my head so the thoughts and words automatically come tumbling out all over this page. May I live so long - may I remember as well. A lot has happened since the last post in January. Spring has come to North Carolina and flowering trees are almost at their fabulous peak. I am getting sunshine and vitamin D in my body finally and all past rantings and manifestos are fading from my frontal lobe. I've decided not to follow through with my application to join the Navy Seal Secret Ops Intelligence Section 6. Mostly because I am not that all intelligent and can't remember three words in a row for the life of me. I also realized in a startling flash of understanding that the Navy Seals would not be all that interested in a 62 old woman who has a great fear of water and can't swim - and is deathly afraid of most bugs. I know that if I were captured by the bad guys and tortured for all my spy-type knowledge, all they would have to do is bring in a bottle of Stink Bugs and I'd talk their ears off. I have been walking every day but telling everyone that I am really running. I have all the runner's clothing down pat except for the lumps in my pockets where I store extra dates, oranges and kleenex for emergencies. I use an iphone app called i map my fitness that uses GPS to figure out how far I've gone. In January I started puffing around the park at around a mile or so a day, aiming for an end of the year grand total of 500 miles. Currently I am walking 4 miles/day with two blocks of honest-to-god-running tossed in (if I have eaten all my dates and oranges). Asheville has a fabulous organization called Riverlink which promotes awareness of the rivers that run through this area, especially the French Broad River. Right now there are about 7 miles of connected walkways right along the river and that is where I can be found most afternoons, smelling the change of the season, avoiding dog noses and wearing old marathon t-shirts found at Good Will. I figured I would spend the walking time thinking artistic thoughts about current and future projects but then I was introduced to Pandora radio on my iphone and figured out how to plug the ear buds into my ears without rupturing anything. 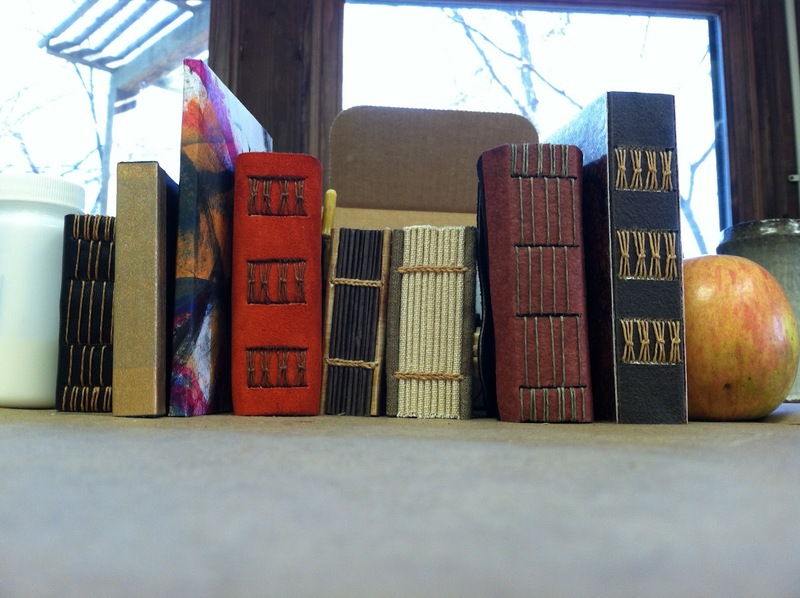 'Bookshelf' of books and bindings learned in D. Essig's class. 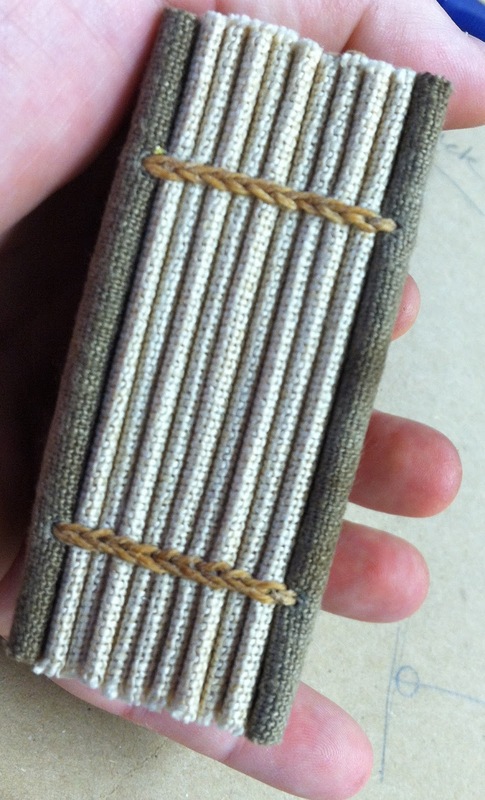 NEW BINDING NEWS: In late January I took a class at John C Campbell Folk School with revered book binding teacher Dan Essig. There is something so invigorating for a teacher like me to be able to take a class and be totally free of all teaching mindset - the schedule, timing, supplies, etc. 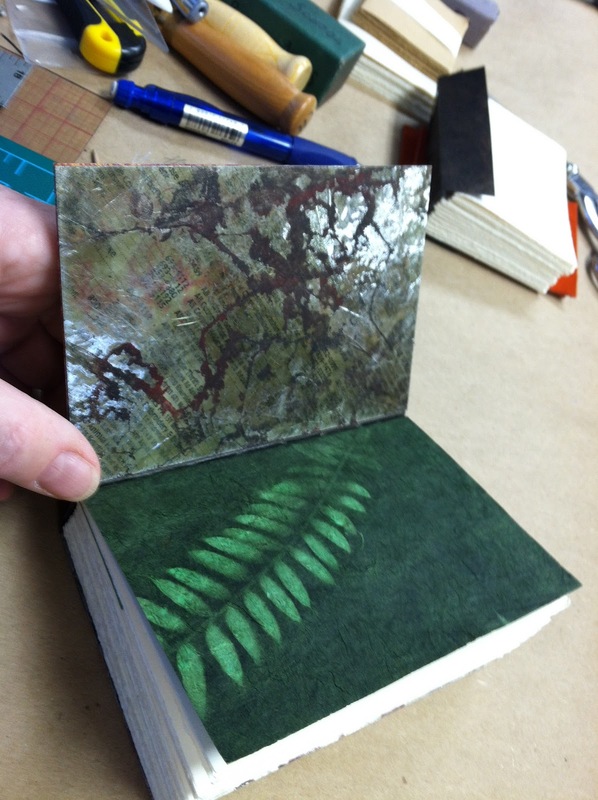 I soaked up new book bindings like, well, a sponge in hot coffee! My mind was full of "what ifs" and "let's try...". I brought a box of old fabric samples from my Indigo dyeing and potato starch printing days and I worked and thought on a new book class idea using all textiles. Cover of the mica book with a hinged binding. This is the interior of the mica covered "Indigo" book. Three different types of mica are used to encapsulate my old indigo shibori samples. Gold toned composite mica pages have windows cut out and replaced with clear 'real' mica. The pages are "drummed" - glued back to back. On the left is the inside of the potato dextrin print book. Dan showed us how to rub acrylic paints into the cracks of the mica. The orange leather (sourced from the Tuesday Flea Market in Murphy, NC) book was my version of the class sample of the above slotted long stitch. I tried to make my own versions of all the books Dan had us make in class (the class title was "A Book A Day") so I would remember how to do the bindings. 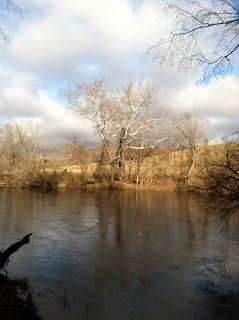 At this point, two months later, I find I am having trouble remembering how to put these photos on this blog!! However there is something that kicks in as soon as I pick up the needle and waxed linen and have piles of neatly folded signatures on one side of me and a giant pile of reference books and notes on the other. One of my favorite book we did which I am going to work into the textile book class was my version of a two needle coptic bound book. The signatures are sewn onto a concertina folded spine guard. In the original class sample the concertina was folded of paper, in my version I used a length of rather coarse linen from Holland. The bookcloth is walnut dyed recycled linen. 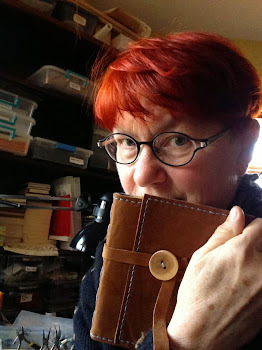 The biggest problem with having a bog and being a slug is that there is so much more I want to write about including a lovely blog award passed on by dear Chrissie Carter up in Lopez island. So I will write tomorrow with hopes that something extraordinary will happen to me on the 'running' path this afternoon. The books that you created in Dan's class are fantastic...But how could they not be? You're a natural! Quite the honor that even your instructor was bowing down to your works. Wow!!!! I don't recall in the resist dyeing workshop, with all of my vegetable steamer creations, anyone bowing;-)))Probably a bunch of vegetable haters in the group! Great job on your walking/running. I couldn't run around the block if a bear were chasing after me. Though I do like some of the jogging attire. Sorry the Seals aren't going to be able to nab you...I'd feel much safer knowing that you were watching out for all of us. God, you are funny. when will you be in Seattle? absentmindedly reading your post i very nearly spat my gin and tonic all over my Mac.